On our open poll, many of you asked to see more statistics on the blog, so we thought we’d introduce a new series of posts all about Postcrossing and numbers. And what better way to start than by looking at some of the data from the year that just ended, right? Let’s do this! That’s right — almost 5.5 Million postcards were registered last year, which was pretty neat! We’ve just passed the 45 million milestone a few days ago, and are on track to celebrate the big 50 later this year. Woohoo! Do you know the difference between an average (or mean) and a median? To calculate the average of a set of values, you sum all the values in your set and divide them by the total number of items in that set. This is great if your values are more or less well distributed, but outliers (both large and small) often distort the end result disproportionately. Enter the median, which can be roughly described as the “middle” value of a data set. If you put all the travel times in a looong ordered line, 17 days would be the value in the centre of this distribution. This is a more reliable value to determine how many days most postcards travel before reaching their destination. Some will be quicker, some will be slower, but on the whole, postcards seem to travel somewhere around 17 days. That’s… yeah. I don’t have words for it neither. We’re way beyond Pluto at this point! Below is the postcard that traveled the longest distance last year. Can you guess between which countries it was exchanged? It’s a trick question because of the content… but if you guessed New Zealand and Spain, you’d be right! Postcard NZ-155857 traveled between a pair of antipodal points: from the north tip of New Zealand to the south part of Spain. And that’s it for last year’s numbers! If you’re hungry for more, Postcrossing has a group of pages dedicated to statistics where you can find more data to explore. I'm wondering the shortest distance between where cards went? And also, the longest time it took for one to be registered? Thank you for all the statistics! It was interesting to find out about it. I love to see them on the blog. I'd find some kind of guessing game very exciting. For example guessing from and to which country postcard number 50 million comes and goes. Similar to the guessing of the exact time. Why are Belgium and Austria ranked equally on the 17th place, when Belgium has more cards sent ? Typo I guess ? Loved this blog - super interesting! @lejo yup, a typo! Sorry about that, I've fixed it. I think there is another typo. Germans took the top 10 spots in the top 20, not 20 spots. @karryan Because Postcrossing enforces a sort of "exclusion zone" around the place where a member lives, the shortest distance a postcard can travel is the radius we've defined for that area. So it's not exactly a random number... and thus less interesting. Every year, there are always a few postcards being registered at 365 days (and a few that arrive even past that date), but it's usually due to mail issues or other special circumstances. Wow, Czechia is the 8th last year! I thing in 2018 it will be worse: our dear Czech Post increases the postage from 1.2.2018 again - we will pay 35 CZK for Europe and 41 CZK for oversea (ten years ago, when I started with postcrossing, it was 17 and 18 CZK). A lot of postcrossers are planning to limit sending postcards. Like Karryan asked, what is the shortest distance? between two postcards. My guess is Germany! March (Easter) and August (Summer) usually biggest school holiday periods so a lot more people like teachers are off so more time to send cards. I get a lot of cards mention they are teachers as they note from my profile my daughters’ are teachers. This is great! Thank you for sharing this statistics. I already wonder if 2018 statistics will be different due to the new traveling feature. Do you have the other end of the spectrum? Slowest delivery? Shortest distance? Top 10 countries with the lease number of postcards sent? etc? Interesting! A couple of people asked about short distances. I drew a member who lived within an hour of my home (36 miles). I mailed the card within hours, thinking it would get there within a couple of days. Wasn't so. It took 11 days. I could have walked it there in less time! (The user registered cards regularly). @karryan - that exclusion zone is good, because there may be multiple users even within a city which technically could send postcrossing cards to each other. - I mean, I wrote cards to Hamburg (Germany) before traveling to there - I could have delivered the card by hand (which could be a great idea). Or cards to Bremen - that's the city where our post from our city gets sorted - so they're arriving there when I post them. This is very interesting information. Thank you for sharing! Amusing stats! Keep going, Postcrossing! Keep going, Taiwanese! I'm proud of you guys! Thank you, love it, I would love to read more posts like this one on the blog, is it possible to put last logged in on each country site instead of random users and is it possible when you when you search users in each country to see the ranking of all users there, you can now see them in alphabet order but it would be great to be able to choose als to see them in ranking order. The longest delivery time is 365 days (I have 1), longer do not register (I have 2). The shortest distance, it is necessary to look for the participants from the villages or small towns. I saw our 4ajka 0.296 km (0,296m away), as well as saw someone from the city of Volzhsky 0.648 km (648 m away). I love the stats, it is so cool how much postcards are exchanged. With the new, USA government shutdown, postcards to and from USA will probably be delayed a bit, so if you are sending to the USA then you should probably, wait for the government to get back on track, it will not take a long time though. Maximum is months. Just so you guys can know. The US government shutdown does not affect the post office. The post office already posted on their Facebook internal news site that mail delivery will not be affected at all. The post office is not government funded. I love statistics and numbers in general, so this was a very fun article! Thank you so much, and I look forward to this year's postcards and stats! I'm with Mapsoo... I'd like to see who's above me in the pecking order for UK and how many more I need to send to go up one place!!!!!! Why to go Postcard lovers. Thank you Post-crossing. Thank you for this great post, I love the statistics. And a special thank you for teaching me about antipodes! What a fascinating concept!! I found a site where I could locate antipodes and discovered that the antipode to my home in Seattle is in the ocean southeast (and nearest to) South Africa and Madagascar. Maybe I will pull a postcard from one of those countries someday. Thought it might only resort the first 1000 in that order to begin with, but no, it seems to be grabbing the top 1000 from the whole UK member list. Thank you for publishing statistics! We all tend to be mesmerized by numbers (unless we have to take a math exam or an exam on statistics!) I think countries rankings will change given that some countries send more cards than the ones close to them by the overall number. For example, I think soon Czechia will overtake Poland and China will overtake Belarus. Or Hong Kong will overtake Portugal. It's hard to say without being able to operate the actual numbers, but these are my predictions. I am wondering how new Travel Mode affected the number of cards sent from more exotic destinations. I think a poll asking only those who travel how many (the range) cards they sent from their vacation (or maybe a percentage) could be interesting even though numbers are numbers and they can be misleading. I'm just curious. It's ok,now we doing more in next year. and a happy new year for all Postcrossers around the World! maybe not the right way to put the question... (I guess I will never know unless I try): is there a way to figure out how many 'really active' postcrossingmembers there are in every country; e.g. exclude members which have not sent/received any postcard over the last 12 months? thanks postcrossing for those numbers and facts!! I would like to know that too @gp37053 . For rare countries or countries with bad postal system, the ranking are misleading. If someone from good postal system country moves to one with poor , they are on top because of his/her past postings but if you check they haven't posted any from the new country. Thank you very much for the interesting statistics!!!! Congratulate Germany on such a great work!!!!!! Happy New Year for all Postcrossers around the World! Only 765972 postcards from not top 20 countries were received... As for me it shows that postcrossing is not well known in most of countries. Or people there simply don't have free money to send postcards. How is it possible to send 2000 cards n one year? I’m just curious because with the random system and the amount of days in one year, it doesn’t seem possible. How does it work? @robinmp: I think it is more a question of money and leisure time. The participants in the top 20 have all the maximum of 100 slots, so they can draw enough addresses. And even the all time top sender Willi has "just" send about 23,808 cards so far, while there are 714,831 members participating. So there are even for him still enough addresses to draw. Of the Russian Federation, 2000 greeting cards a year, that's about 3000 euros per year. How awesome! A big round of applause to everyone! Thank you for this article. I like reading all the different statistics. Thanks, Postcrossing for this interesting blog, it was really fascinating to read. Also thanks to American postrossers, who told the information about your mail service regarding the recent government events. I will take a note on that, post will be served normally. Excellent work. Great performance presented even better. I loved reading it and felt proud to be part of this community. Happy Postcrossing! How many card was sent from Brazil in 2017? I think you should really do something about the financial and cultural dominance of several large PC communities. You should much more actively promote cultural diversity here, otherwise this excellent and lovely "more-than-a-hobby" will eventually become nothing more than an outlet of rich folks from northern hemisphere, who can afford astronomic amounts to spend for postcards... Seriously, even if I would like to, I cannot afford mailing 2500 postcards a year, hell no, this would represent almost FOUR MONTHLY SALARIES here! It is absolutely insane to see that all top 10 most active guys are all from Germany and together they mailed insane amount of postcards, more than 25.000, which is far more, than for instance number of ALL postcards, mailed from bottom 100 countries in Postcrossing EVER. Get your head out of the sand please and let us start doing something about it. Wow! Interesting data! Also, I never expect Hong Kong ranked 16th for postcard sent. I am one of the contributors. So good.! I want to see received statics of 2017 Actually. I am a postcrosser from Ukraine and I am always offered to send many postcards to Russia, which borders my country. That's unfair. Mail service in this country is slow as hell and I have to wait 50 days on the average to have my postcard registered even at the smallest distance. I'd rather prefer to receive addresses from countries such as Austrailia and Zealand, which are quick, rather than Russian ones. I think every member has approximately the same distribution of Sent/Received cards from a particular country, especially when there are enough cards to even the numbers out. After all, it's "a numbers game". I saw only one member who sends 45% cards to Russia and I believe it's by choice (given his experience - more than 2,000 sent cards). Speaking of "rich folks" - I have been once told that "the richest people are not the ones who earn the most, the richest people are the ones who spend the least". :))) Clearly none of us fits this category as postcards are something we can do without. Also, if postal service in Russia was as expedient as it is in Germany, Russia would have become the dominant country just by sheer amount of members sending fewer cards per member. But given that richest people can allow to travel, it would make a difference if when they begin sending cards from those countries. Even if Russians will visit former Soviet Republics such as Georgia or Armenia, Azerbaijan - it would be nice to receive a card from there. I think postcrossing is more about people than it is about postcards and maybe there are advantages to having "dominant" senders? There should be. Maybe the quality of a card is more important than where it is from? Which card travelled the longest distance of all time? @post_tenebras_lux: Czechia sent ~ 20% the cards of Germany with ~12,5% the inhabitants. So per capita, you guys in CZ are even more 'bad' than some others. The dynamic of many versus few active users has various reasons, not only money. Tradition, media-coverage, active network. But yes, of course postcrossing is easier in affluent regions. I am sure postcrossing's managing team appreciates any useful suggestions you bring. The maximum of possible postcards traveling is 100, btw. So even superusers cannot grow endlessly. As for Russia, both you and Sellena are within the range of variation we all face. But you might check your 'repeated countries' option - maybe it's active. 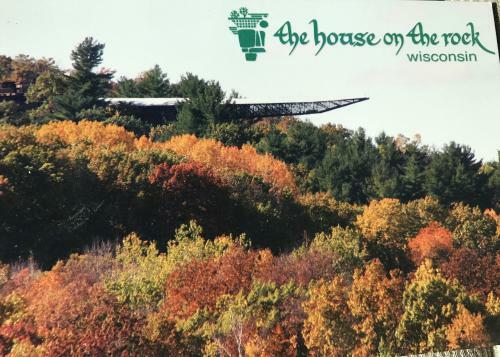 I recognize that House of the Rock Postcard. We visited it on a vacation over 20 years ago. I'm sure i sent the same card to someone back then. Impressive statistics. @karryann and @meiadeleite, in 2016, I received a postcard from a User in my region (or rather "Landkreis", a kind of political district). She wrote that would have come round if she had had to do something near my place. And it's funny when you draw a User you already know from private swaps via Facebook and/or meet-ups. Absolutely loved the stats! Way to go Germany!! Can't wait until we see the BIG 50 and I'm going to do my best to help get us there! I love Postcrossing! So the real challenge seems to be, how to increase participation among the lower rank countries. It would be great for everyone to help send/receive from smaller and less common places. I am fascinated by the coincidences that happen in postcrossing. I had a postcard written in German, so I took it to my German born friend and she was telling all about the different buildings on the card - "WOW is that all written in there?" I asked thinking it wasn't that many lines for so much information! "No" she said "That is where I lived for 20 years and my mum still lives there!..." She was as excited as me about that postcard, we have shown it to all the people we work with! It seam like Minna71, uttia4 and hepman are going to take the lead on the world list in rhe near future together with the three irish people, that is if they keep on sending so much, the three people on top of the world list have dominated for a long time but Minna71 from Finland is soon taking over third place it seam, top three on the world list has been the same since I started over five years ago and top two is still going strong in the lead. I'd like to know active member. Who has logged in past 6 months. I like to know about the average and median travelling time of postcards to and from the different countries though I know that there are many factors influencing it.